A disabled man has spoken of his dismay, claiming he was discriminated against by a tram conductor who refused his money and left him stranded on a station platform. Drew Bain has severe dyslexia which means he is unable to read the information on machines in order to purchase a ticket before boarding the tram. Drew Bain spoke of his dismay after a conductor refused to accept his money and left him stranded on a station platform. As a result the 42-year-old usually explains his condition to the on-board conductor and hands over the exact change to buy his ticket. But upon his last trip to the airport the Edinburgh man was initially flabbergasted when the member of staff firstly refused his cash on the busy carriage. To make matters worse, she ordered him to leave the tram and while he was struggling at the ticket machine, ran back on the tram before it departed, leaving Drew in disbelief. He told the Evening News: “I can’t read the signs and when the conductor came down she ignored my explanation and said she’s have to charge me extra. Why should I pay more because of my disability? It felt like I was being discriminated against. “She wanted me to go to the machine and I said I’d need accompanying. When my bags were off she just turned around and ran on the tram and it set off. I couldn’t believe what was happening. Drew was finally able to arrive at the airport for his work-related trip to Austria when he decided to call Edinburgh Trams to lodge a complaint, only to discover he was not the first to bring the shocking ordeal to the attention of the firm. “When I called up to complain it turns out another person had seen what had happened and phoned even before I did. Self employed Drew admits day-to-day life can be a struggle, from reading a menu in a restaurant to road signs. But he feels more provision is needed on the trams to meet the needs of the disabled. He added: “Most places have something in place for people with not just physical disabilities. When I get a train from Waverley someone can help me get to my train and seat. At the airport someone helps me through security and to the plane. A spokesperson for Edinburgh Trams said: “We were sorry to hear about this customer’s recent experience travelling on Edinburgh Trams. We’ve been in regular contact to understand the exact circumstances and have agreed a way forward to prevent this happening in the future. 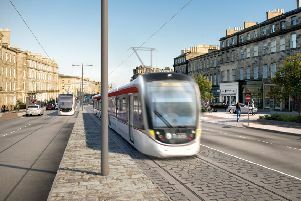 “We do our best to ensure Edinburgh’s tramway is as accessible as possible by promoting initiatives such as the Thistle Assistance Card or Police Scotland’s I AM ME campaign.